Tiffany Yong: There was an odd sense of anticipation for me when I was watching God Of War, perhaps because Vincent Zhao had been my favourite version of Huang Feihong (黄飞鸿) as well as Fang Shiyu (方世玉) . It’s been ages since I last watched him on screen, and I wasn’t disappointed. Peps Goh: The cinematography was the first thing that stood out. In terms of both editing pacing and visuals, it felt like they picked 2 completely different, and yet most appropriate flavors to present each side (Japanese and Chinese). Tiffany Yong: I love how the film did not try to purposely villain-nize the Japanese nor glorify them. It was oddly satisfying watching a Japanese narration of their perception of Qi Jiguang, in a very Japanese way in a Chinese film. Peps Goh: When it came to the military strategies, it really was a fun watch. They managed to effectively communicate the strategies used to the audience, with almost no exposition, but with effective choreography pair alongside great screenplay. There wasn’t a single moment where i didn’t understand the martial ‘chess’ game being exchanged. Tiffany Yong: The long-awaited fight between Vincent Zhao and Sammo Hung seemed quite unnecessary initially, however, when I saw how the director managed to tie it nicely to the film, I nearly stood up and applaud for the brilliance. Tiffany Yong: We know the amount of screen-time usually amounts to how memorable or how important a character is. But Wu Yue managed to bring out the supporting character Yang Chao extremely well with the little scenes he had. With only 2 major scenes and several other minor scenes, he managed to give the character an emotional arc and change. From a comedic and cowardly leader to his heroic sacrifice, the whole transition was smooth and touching. Peps Goh: The story is straight forward and clear cut, but at no point did I find this film uninteresting. They had also included scenes and moments that wasn’t directly integral to the main plot, but does a lot to let the audiences understand the kind of persons these warriors are outside of the battlefield. And they accomplished these not with regular dialogues that are the usual go-to tools of average film-makers, but instead with scenes of tasteful humor, and loaded silences. Tiffany Yong: I was amused by the interactions between Qi Jiguang and his wife, Madam Qi. It felt almost 21st century, the way Qi Jiguang was brave and scheming in the battlefield, but timid and gentle when it comes to dealing with his seemingly-gentle wife. Both of us love how Wan Qian brought out the personality of Madam Qi without saying much. Peps Goh: All in all, I really have nothing to complain about this film. It may very well be, in my opinion, the best Chinese war film in the past handful of years. If there was any fault at all, it was that in it flawlessness, it left me hoping for even more. Kumasawa, the commander of the joint operation of pirates and ronin, was acted by Kurata Yasuaki, a Japanese actor specializing in action movies. Fluent in Cantonese, he’s an accomplished martial artist, best known for his extended battle against Jet Li in Fist of Legend and for his villainous role in So Close. He also acted with Vincent Zhao in Hero of Shanghai (中华大丈夫 1998) as his father-in-law. Sammo Hung and Vincent Zhao are two well known martial artist experts in China. However, this is the first time they actually had a fight scene together. Vincent Zhao revealed that they nearly had a chance to work together 20 years ago. But somehow things didn’t work out. Hence, both were very glad to have a chance to fight together. The lyrics of the theme song “Victory Song” (凯歌) was adapted by poems written by the historical figure Qi Jiguang. Gordon Chan is a fan of military history and view Qi Jiguang as his idol since young. The production could start a year earlier, but the director felt that the research wasn’t sufficient. Besides visiting all the museums, he decided to visit Matsuura, Japan to understand more about the nomads’ background as well as to collect more information of how the Japanese’s impression of Qi Jiguang. He realised that the Japanese did not try to hide their failure, instead they were impressed by Qi Jiguang’s ability to win the battle of 20,000 with just 3000 soldiers. Check out God Of War (荡寇风云) Official Microsite! 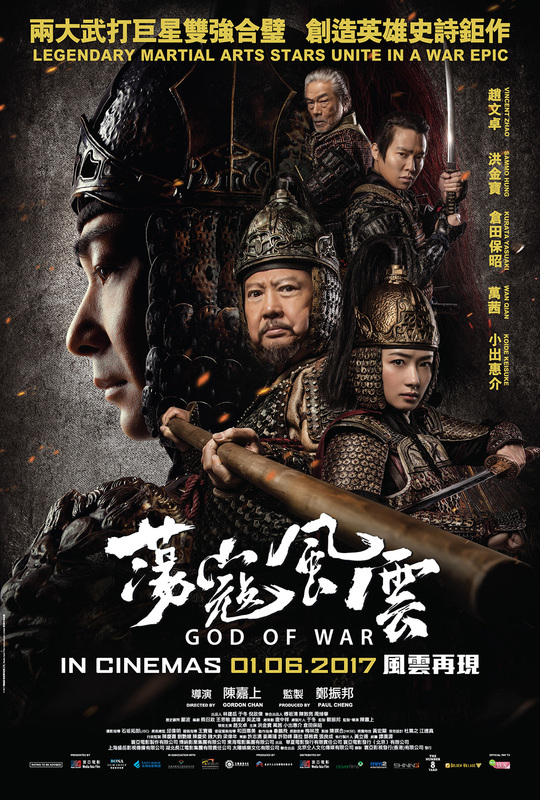 God Of War (荡寇风云) is out in cinemas on 1 June 2017. I love movies with a historical set, I pay much attention to costumes, although I’m not much into chinese culture, this seems like a nice movie to watch! Thank you for the review! I love these types of movies and grew up on them! My kids are always teasing me because I am always making them watch these types of movies… but they are the best action films out there! I can’t wait to see this movie! Not my type of movie, but thanks for sharing. I’m sure others would love it. Beautiful pictures! Looks interesting to watch! the film looks good. I ll watch it. thanks for sharing. This is the type of movie my fiance would love. Hope it’s a big hit!